Hey everyone! How was your weekend? Yesterday we ran some errands and treated ourselves to all you can eat sushi (our favorite). Today I'm definitely planning on doing some Halloween nails and maybe getting some baking in. Today I'm sharing my Fountain of Truth Voxbox that I recently received from Influenster. I'm always down to try some new skincare products as we head into colder weather so I was really excited to try these out. Influenster is an online community of consumers who give reviews on products and experiences. 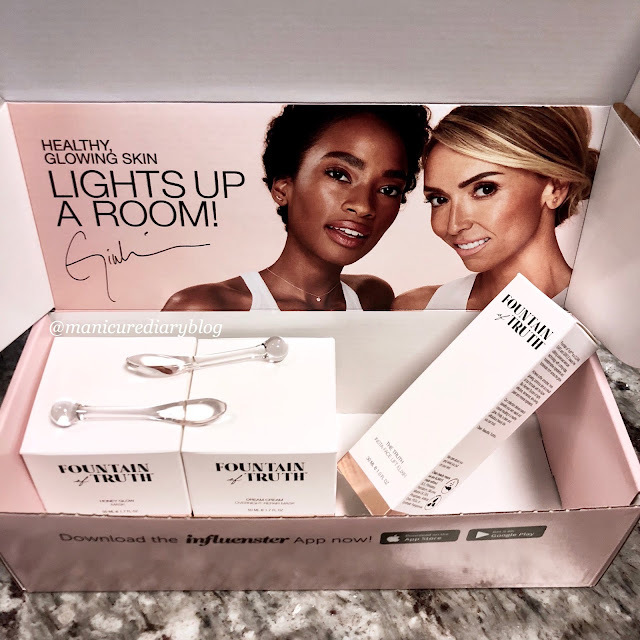 If you are active on the site, Influenster may invite you to participate in their VoxBox programs, where members receive complimentary products to review. 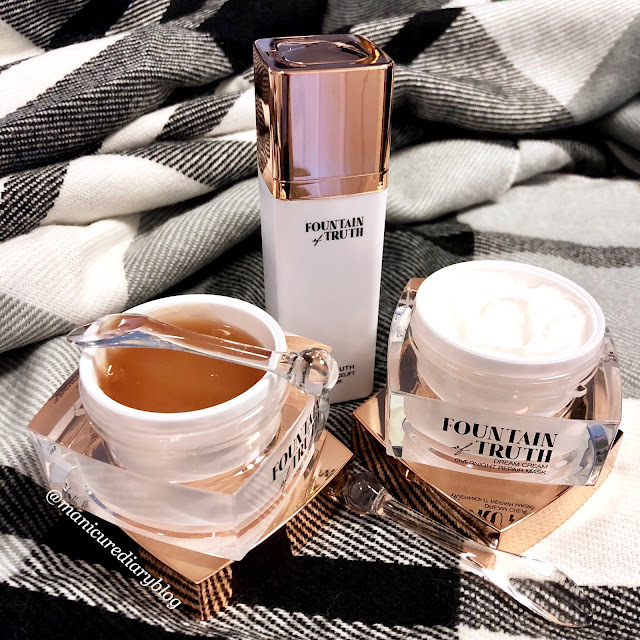 I had never heard of Fountain of Truth, so I did a little research into the brand and found out it was founded by Giuliana Rancic. It is a clean, anti-aging beauty line that is safe, effective, and luxurious. They have also made it a part of their mission to partner with FAB-U-WISH and The Pink Agenda in the fight against breast cancer. So far this brand sounds pretty awesome! A light-weight treatment that can help your skin fight the visible signs of aging. Developed to reduce the appearance of fine lines and wrinkles, this product claims to create a look of plumpness and volume. With continued use, skin's appearance will improve and take on more bounce and radiance. How to use: Apply one pump over entire face and neck in both the morning & night. The verdict: Love the twist up of the bottle cap - very cool and fun to use! The fragrance on this one was also a little strong for me. Kind of had a minty scent, which I'm not a big fan of. I haven't seen any immediate change in my skin, but will have to keep using to see if I notice anything. An overnight, transformative sleep cream that replenishes moisture and the appearance of fuller looking skin. Helps wake up your skin, making it appear smoother and brighter with a dreamy glow. How to use: Massage a generous layer onto the face and neck. Leave overnight. The verdict: Firstly, this stuff is THICK. It's difficult to blend into the skin because of how heavy it is. I honestly wouldn't recommend sleeping with it on because it will stick to everything. Maybe try it more as a wash of mask? I hate fragrances, so the herbal scent in this product was just a little much for me. I may give it another go in my dry areas during the winter. This mask enhances and hydrates skin for a dewy, youthful appearance. The creamy, soft texture warms when massaged and will nourish and revitalize, for a glowing, smoother and softer appearance. How to use: Apply a thick layer over the entire face. Massage for one to two minutes while it warms. Leave for 15-30 minutes. Rinse thoroughly with warm water. The verdict: It's no secret that I have sensitive skin, so when a product is "warming," it makes me a little nervous. For that reason, I made sure not to leave this on for the full 30 minutes. The texture is pretty thick upon application and has a pleasant, sweet honey scent. It smoothed out once I put it on and it was a little warming, but nothing irritating. My skin was super soft when I washed of the mask and felt hydrated. I plan on continuing to use this once a week. Overall my favorite product was the Honey Glow Mask. The fragrance in the other two were just a tad bit strong for me. The packaging on all of the products is beautiful and looks great sitting out in the bathroom. I'm going to continue using these products and see how they perform in the winter when my skin needs the most help.